As we know, story maps have emerged as a powerful communication platform, leveraging the power of web-based GIS to tell “stories” about important connections among scientists, resource managers, and policy makers; and how combining the new medium of “intelligent Web maps” with text, multimedia content, and intuitive user experiences has a great potential to synthesize the data and amplify the interpretations. Story maps are now informing, educating, and inspiring on a wide variety of scientific and policy issues. But can story maps be academically citable? Indeed, many scholars and teachers are turning to story maps over PowerPoint as their primary presentation tool during conferences, workshops and in the classroom. Some have ventured as far as inserting story maps into their academic blogs, annual reports, proposal progress reports, theses, dissertations, and even peer-reviewed journal articles (e.g., see this catalog of analytical/scientific story maps or Bern Szukalski’s Things you didn’t know you could do with Story Maps). This begs the question, how do you make your story map citable, especially if you wish it to be properly referenced in scientific publications? And further, what is best practice at this stage for doing so? In the academic and scientific world, digital object identifiers (DOIs) have entered the realm of best practice when citing a journal article or a book, as well as accompanying supplementary datasets or standalone datasets (for further reading on citations, including with DOIs see Gallagher et al., 2015). • Wright, D.J., 2016. 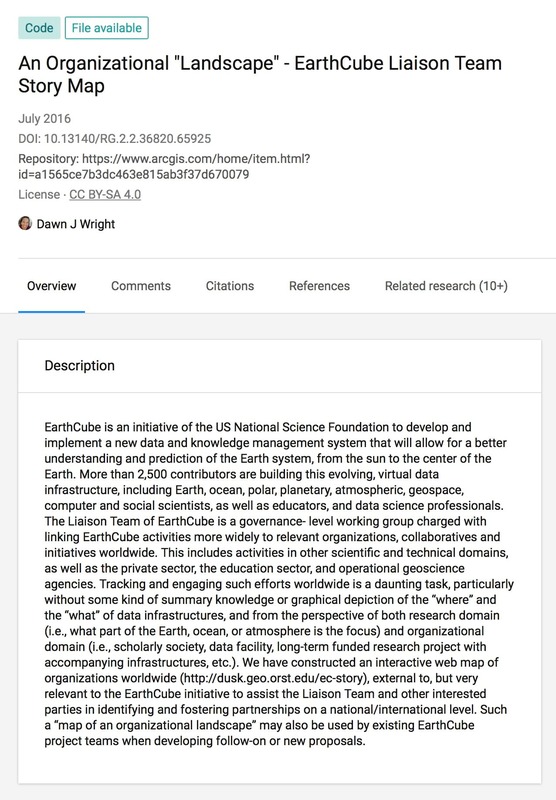 An Organizational “Landscape” – EarthCube Liaison Team Story Map, ResearchGate, DOI: 10.13140/RG.2.2.36820.65925. • Wright, D. (ed. ), 2016. Supplementary Digital Resources, Ocean Solutions, Earth Solutions, 2nd edition. Esri Press, Esri, Inc. DOI: 10.17128/9781589484603_d. (see chapters 3, 11, 12, 15, 17, 20, 21). • Wright, D.J., Chandler, C., 2015. Indian Ocean Research Data: Past, Present and Future, ResearchGate, DOI: 10.13140/RG.2.2.22193.02403. • Wright, D.J., 2014. 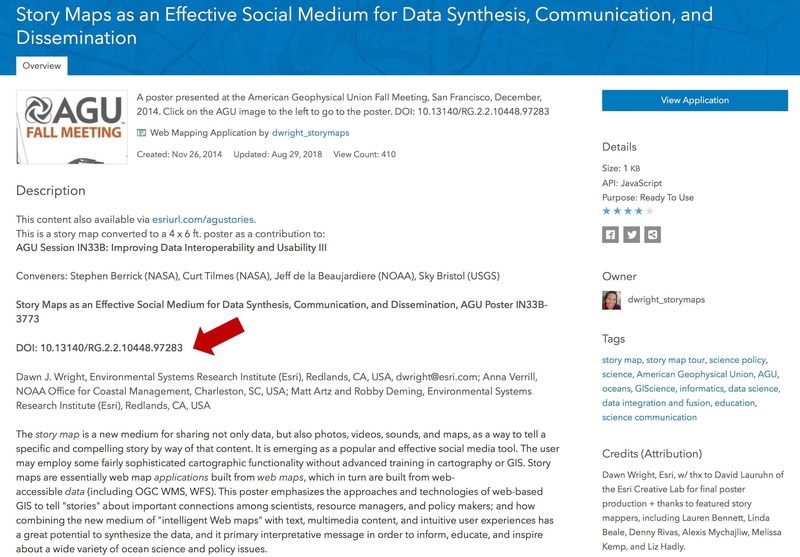 Story Maps as an Effective Social Medium for Data Synthesis, Communication, and Dissemination, ArcGIS Online, DOI: 10.13140/RG.2.2.10448.97283. • Wright, D.J., 2013. Have I Been a Data Scientist from the Start? Parallels from the Geographic Information Science Community in the Early 1990s, ArcGIS Online, DOI: 10.13140/RG.2.2.25548.46723. • Wright, D.J., 2013. Participation in Social Media as Academic Service, ResearchGate, DOI: 10.13140/RG.2.2.15482.13769. 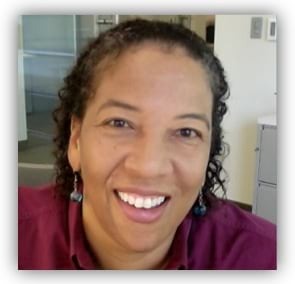 With regard to suggested practice when seeking to make your story map academically citable, I would suggest starting first with the item page/home page on arcgis.com. This is where you should put as much descriptive information as possible. As a second step, one may go to an academic social networking/research archive site such as ResearchGate, or digital repositories such as Dryad, Zenodo, or F1000Research in order to obtain a DOI for your story map. Once obtaining the DOI, you can add that DOI to the other existing descriptive information on arcgis.com. Using ResearchGate as an example DOI provider, you can add a story map as “code” or “presentation” or “poster.” As long as you do indeed upload a pdf of the story map ResearchGate will accept that as an item for which it can assign a new DOI. Most of my story maps were actually refashioned as 4 x 6 ft posters that I presented at the American Geophysical Union (AGU) meeting. AGU (and other organizations) will of course give you a full citation to use for any abstract of a poster or oral presentation that you give at that meeting. So if your presentation is a story map, there is one reference for you. But these organizations are not (yet) assigning DOIs to those abstracts. I categorize a couple of my story maps as “code” on ResearchGate because I built the story map on a server other than arcgis.com. I include the pdf of the story map as well as the HTML code. But again, the main purpose of this is to get the DOI from ResearchGate. And of course, you can include similar descriptive information on ResearchGate as an overview of the story map, but ResearchGate does not give you as many options for description as arcgis.com does. Several of us at Esri met earlier this year to discuss the implications and a possible way forward for Esri to more fully support DOIs within ArcGIS.com and the Living Atlas of the World. At this time we are not able to “mint” DOIs for items in ArcGIS Online, including for story maps, but it seems feasible at this time to let others provide that service, such as ResearchGate, Zenodo (perhaps even OGC at some point), who are already DOI naming authorities/”minters.” Within the federal government, NOAA and USGS are doing wonderful work with DOIs too, but mainly for datasets (by the way, this page from the EPA outlines some great story map guidance for their agency, including best practice examples, specific guidance on 508 Compliance and accessibility of stories. And stay tuned in the future for the possibility of an academic journal with story maps as the publishing medium. Discussions are still ongoing as to the structure of the journal, the publisher, the editorial staff, and more. Story maps fall into an interesting category as they encompass datasets but also narrative text that could essentially be in a journal article, a book chapter, or a technical report. It will be great to see story maps cited more often in these outlets and included in data archives and repositories. Thanks to Charles Carroll for originally bringing up this issue on GeoNet, and happy story mapping and citing!